After Tianjin drivers were confused by traffic-restriction orders from local environmental and transportation bureaus during a succession of smoggy days early this week, the need for timely smog alerts and forecasts has become urgent, authorities said. 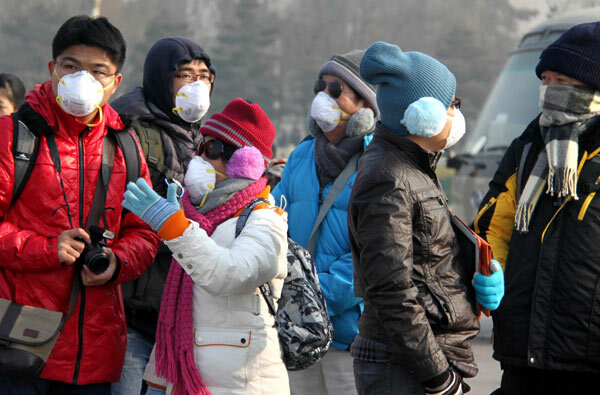 Tourists wear filter masks in Beijing on Wednesday to avoid inhaling pollutants. Hebei, Beijing, Tianjin, and five provinces in central and eastern China have suffered heavy smog recently. The China Meteorological Administration and the Ministry of Environmental Protection signed a cooperation framework on Tuesday to strengthen forecasting during stretches of heavy pollution. It is the latest measure taken after the publication in September of a detailed action plan to tackle air pollution. The plan said coal consumption will be cut and new industrial projects, such as power plants and steel mills in key cities and regions, including Beijing and the Yangtze River Delta, will be banned. The framework said when weather conditions are likely to bring severe smog, the national weather and environment authorities will activate a joint discussion mechanism and issue air pollution alerts together. Feng Lei, deputy director of the disaster relief department under the China Meteorological Administration, said the cooperation between the two bodies will enhance the air quality forecasts and warnings. He added that a trial project in urban air quality forecasting would be launched to help locals learn about expected air conditions in advance. The framework emphasized information sharing between the two. That information includes air quality monitoring data, weather satellite data and atmospheric data. China has been under heavy pressure to address the causes of air pollution as thick and hazardous smog has frequently engulfed the country since early this year. Severe air pollution even forced people clad in Santa Claus clothes delivering gifts on the streets of Beijing to wear anti-dust respirators on Christmas Eve, which fell on Tuesday.